Forced rhubarb does appear to be sweeter. RIP your greenhouse and seedlings, I know how you feel and spent yesterday patching my polytunnel after the ravages of winter, it’s ready for action now and I’m sure you will catch me up way up here, no problem! I just love rhubarb and will happily eat it fresh from the garden… I feel that I should go to the effort of cooking with it as it can be so beautiful! Those winds have been fierce so I hope your polytunnel holds up okay. Sorry to hear about your greenhouse and seedlings! I’m intrigued by the idea of forcing rhubarb (I don’t think it’s really done much here in the US) and I think I may give it a try next year. It can be done easily with an old bucket… but I like the terracotta pots that look really pretty whilst doing their job! My fleece tunnels survived the wind, but the cats seem to think that they’re an adventure playground, so have had to take them off my seedbed because it is getting trampled to death in their games of hide and seek. Found one cat with head poking out of tunnel and the other outside ready to pounce on sibling – grr. Trampled soil and grumpy gardener! No seedlings yet, so don’t know if they are done for or just not emerged yet. Thanks Sophie – I’m pleased you saved your seedlings. I can’t wait to get a proper greenhouse but it’s nowhere near the top of my wish list yet. Shame about your seedlings – but you’re right, a later sowing will soon catch up… especially this year. I love the colour of your forced rhubarb – worth forcing just for the artistic effect! Oh dear, poor greenhouse and poor seedlings. The ones sown later nearly always catch up though, and I’m only sowing this week anyway. Your rhubarb looks magical! Look forward to hearing the results of the taste test! Thanks Cathy – you’ve made me feel better about the sorry state of my seedlings. It seems we’re all up against it this year! You with the wind ravaging your greenhouse and seedlings and me with a dog who thinks it appropriate to bury his bone in my freshly sown raised bed! We’ll all get there eventually though. Good luck! Ha ha – are you sure you didn’t prepare that fresh raised bed just for your dog’s bone? Sounds like a perfect place to bury something! I’m sure that’s what he thinks too! Maybe he was hoping to grow a bone tree! So sorry to hear about your seedlings, but still having a big giggle about unfortunate greenhouse now being “modern art”! I’m highlighting your blog and others I really enjoy in my latest post. I love rhubarb but have never grown it. I really need to try! A shame about your greenhouse! Fortunately your car was spared damage. 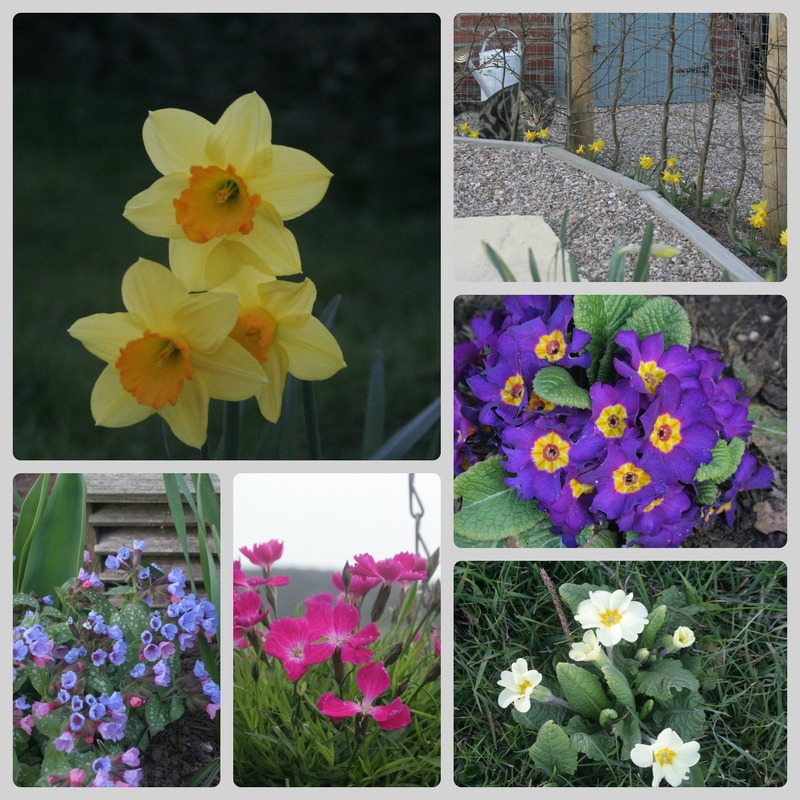 Your blooms are beautiful and a lovely start to spring! 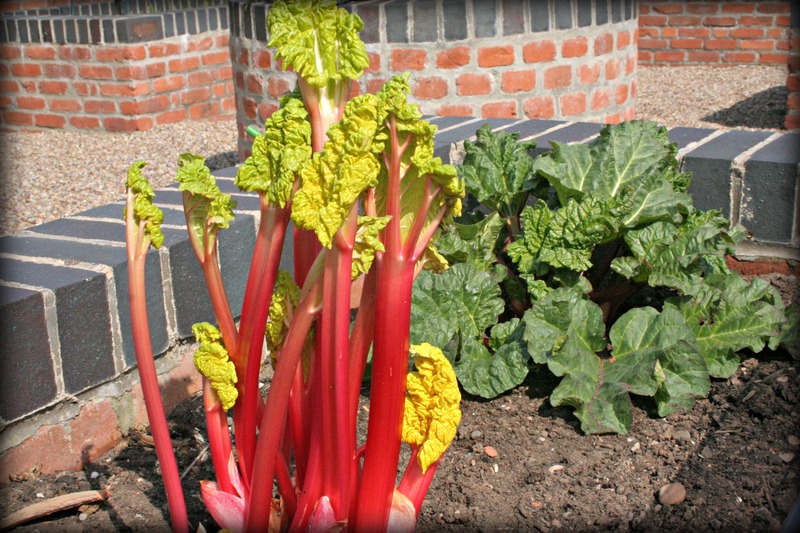 Rhubarb is probably the easiest plant to grow over here – does it grow in your climate okay? Spring has certainly sprung! A few years ago, I had a small hoop house, and the same thing happened! Garden hugs…we had 8 more inches of snow last night! Gardeners are made of sturdy stuff – unlike plastic greenhouses! More snow?? Sending you warm thoughts and more seed catalogues…. The funny thing is that we’ve had major wind and cold snaps but not a lot of rain so the soil is looking dusty… I smell a drought on the horizon here!! It will soon be summer and floods again I suppose. Now that your greenhouse is modern art, have you seen the greenhouses that people build out of old wooden windows? I have seen the recycled greenhouses – I need to replace my windows at some stage so who knows? New windows for the house are a higher priority than a new greenhouse at the moment! Hi Boomdee! Your artistic eye always sees the details. The cats are loving being outside with the sunshine on their whiskers. They come in smelling of grass and soil… and I love to see them chasing butterflies and climbing the trees. I love those thin tender stems of forced rhubarb, will definitely have to force some of mine in the future, yours looks so tempting. A cheery sight after your greenhouse blowing over. Looking at your beautiful forced rhubarb I was thinking again how much I would like to have a rhubarb forcer. Sure a large plastic container will do the job but those terracotta cloches are so beautiful, and you are lucky to have one. I have not been able to locate them in the United States. Will you share the results of your taste test? Meanwhile enjoy the rhubarb. My sister-in-law bought it for me a few Christmas’s ago… it is lovely and I would like to get a couple more but they’re quite expensive. Taste test results will be coming up! How frustrating that your mini-greenhouse was destroyed by the winds, they were terrible and there were at least 4 greenhouses and polytunnels at our allotment site that were damaged. Enjoy your rhubarb. I’ve just harvested the first crop from mine and it was delicious, it wasn’t forced though. Maybe another year. The start of the year hasn’t been good weather wise – and to top it all I’ve found a nursery of slugs under one of the plants in the garden! I only started forcing my rhubarb because I fell in love with the terracotta forcing pots… I’m so shallow! Oh that is too bad about the greenhouse….love the colors of that rhubarb. The rhubarb really is a fantastic colour when forced. We’ve had some gusty weather recently so I should have been better prepared… next year maybe! What a shame about your greenhouse, the high winds are so annoying. I’ve never forced any of my rhubarb but will be interested to see if you do find it any sweeter. It’s certainly taller and pinker (if that is a word!). It is unfortunate that it’s such a big plant…. it’s a shame you couldn’t bonsai one (although miniature rhubarb wouldn’t go very far)!! 🙂 I definitely like rhubarb young and tasty as stringy rhubarb is something that would put you off it for a long time.